The Kellogg School of Management has announced a new award that recognizes outstanding research and scholarship among the schools faculty. The Stanley Reiter Best Paper Award will be awarded annually and will highlight the academic article judged best among those published by Kellogg School faculty in the preceding four calendar years. A selection committee will accept nominations from Kellogg faculty and make a single selection based on the articles creativity, craftsmanship and disciplinary impact. Kellogg now has two awards that recognize outstanding performance by a faculty member, the L.G. Lavengood Professor of the Year Award for outstanding teaching, and the Stanley Reiter Award for outstanding research. Professor Reiter  who is the Charles E. and Emma H. Morrison Professor of Managerial Economics and Decision Sciences  was selected as the inspiration for the new award because of his unflagging commitment to research excellence, said Associate Dean for Academic Affairs Robert Magee. 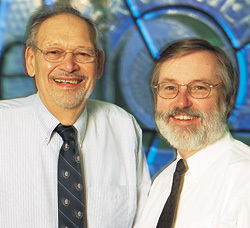 A lot of people view Stanley Reiter as the intellectual godfather of the research culture at the Kellogg School, said Magee, who noted that he himself was drawn to Kellogg in part because of Reiters presence in what became the schools Managerial Economics and Decision Sciences department (MEDS). Stanley helped found MEDS, and as a catalyst his rigorous style of research enticed a lot of other fine scholars to come to Kellogg  not only in MEDS, but in Finance as well, Magee added. Professor Reiter received his PhD in Economics from the University of Chicago in 1955 and joined the Kellogg School faculty in 1967. He has published four books and dozens of research papers in his career. He received a Guggenheim Memorial Grant in 1961 and is a Fellow of The Econometric Society, a Fellow of the American Association for the Advancement of Science, and a Fellow of the American Academy of Arts and Sciences. As one example of the importance of research, Reiter noted that the current MBA program at Kellogg now teaches many subjects that were the results of research conducted two or three decades ago. In my time at Northwestern University, Ive tried to help build a research community with high standards and to work in the fields that are the disciplinary base of management practice, said Reiter, adding that he believes the new award recognizes these objectives and testifies to Kelloggs ongoing commitment to strive for research excellence.